In 1982 I was a sophomore at a small college in the Midwest. It was the beginning of second term and I was again standing in line at the on-campus book store waiting to pay for a too-heavy stack of text books. The line was not moving at all so I put my books down on the floor and started flipping through the coffee table books on display. The book I chose to pick up first was titled Rolling Homes – Handmade House on Wheels by Jane Lidz. Thus the seed was planted. This project was first published on vonslatt.com but I recently put together this video so I thought I'd collect some of the best images from the original build log and re-publish it here since was really the first steampunkish project I did. For those that watched video: Yep, that my power cord dragging behind the bus! It caught on a tow hook when I disconnected it. However, I didn't run out the full 100' so it didn't rip the outlet off the house, um, this time. The salon is the star of the show, I can not express how pleased I am with the way it turned out! Even more so because all of the wood you see here and most of the fittings were scavenged from the recycling bins at our town dump, something that to my great consternation is no longer allowed! The lamp hanging over the table is a New York Angle Lamp, a kerosene burning wick lamp. We use it quite often when camping and it produces as much light as a 60 watt light bulb and adds a wonderful ambiance. 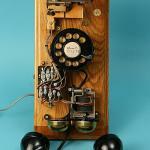 I bought it online and refurbished it a couple of years ago. I was trying for a Victorian look in my design, I wanted something that had the feel of a sea coast summer house that had been in the family for generations. Something bright, light, and simple but with an air of country elegance. All within the constraints of material I found or was given. 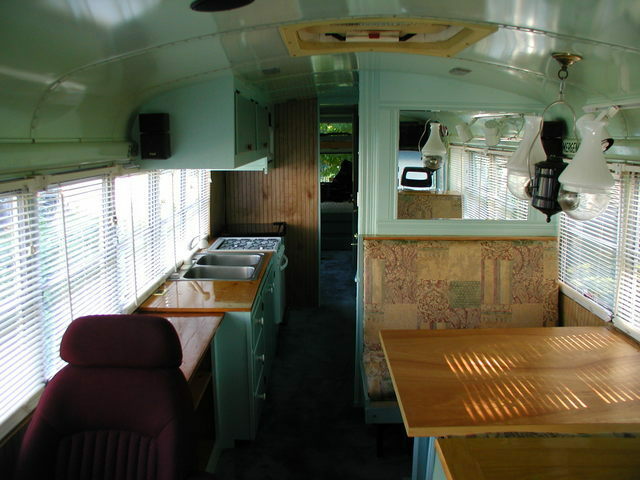 If you are thinking about converting an old school bus into a motor home one of the first things you should do is give it a paint job. In fact, in many states you may not be allowed to register a yellow bus until it's painted. I went with a nice green and almond livery, the lighter color on top to help keep the bus cooler in the summer sun. Q. Do you need a special drivers license? A. Nope, not as long as it is registered as a recreational vehicle, no matter how big it is. 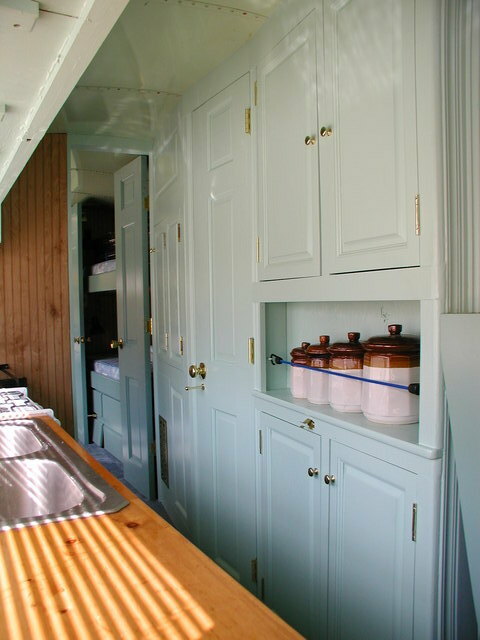 Most states have some requirements as to what constitutes an RV and this usually means you have to have such things as a 110 volt electrical system, a bathroom and built-in beds or bunks. Q. Why not just buy a used RV? A. Because I wanted something different, something I made myself. Also, school buses are very, very tough and thus much safer then an RV in an accident. A. About $2000 for the bus, $750 to have it delivered from about 300 miles away on a flat bed, and I figure I've put about $3500 into the conversion – but some of that was for tools which don't really count. I bought the bus on eBay and I was lucky. A bus like this is usually about four grand. Q. How fast does it go ? What kind of gas mileage do you get? A. 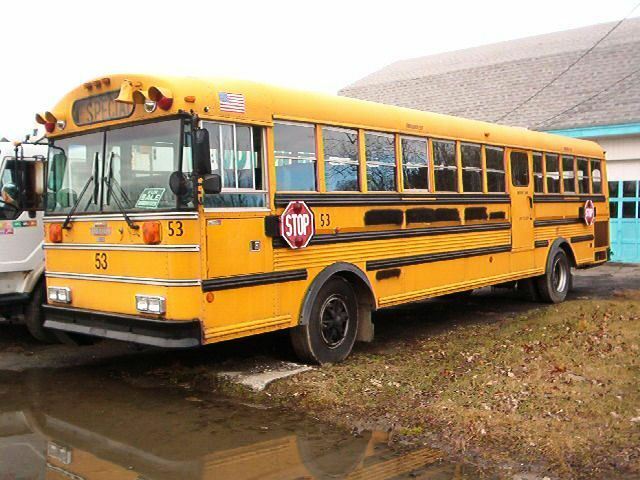 My bus is a 1989 Thomas Saf-T-Liner with a CAT 3208 10.4 Liter diesel engine and around a 100K miles on it. It's got 210 HP but gobs and gobs of torque so it will do 60- 65 on the highway and get 9-11 miles per gallon. Its also great for pulling stumps. Q. How did you paint it? 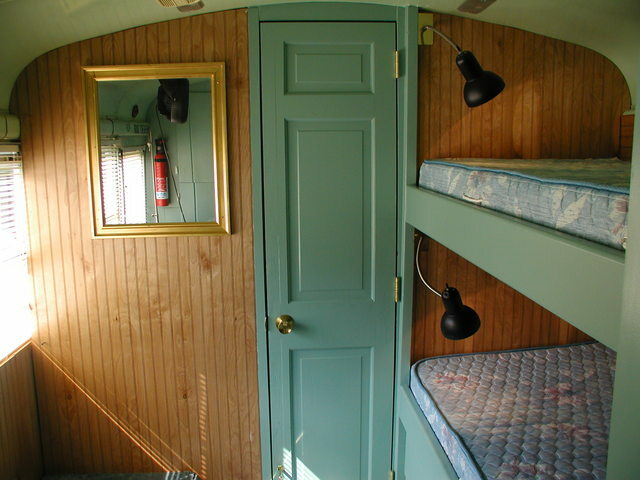 This is the crew's quarters, I cut down full sized pine doors for the passageway and used full sized brass hardware. The bead-board paneling is one of the few bits of new material I purchased. The bunk are covered with a queen-sized latex foam mattress that has been cut in half with a carving knife. The lamps are conventional Edison base fixtures and I've made adapters that convert them to take 12 volt automotive tail light bulbs. This is the door to the bathroom and the kitchen cabinets. 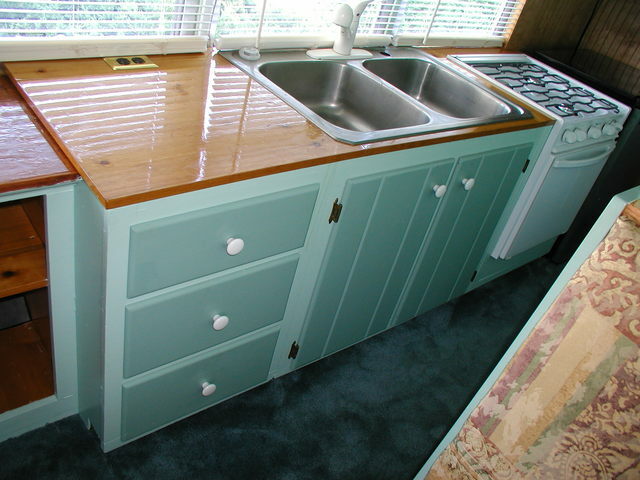 Much of the cabinetry came from Craigslist.org and from friends who were renovating their kitchens. I trimmed the edges off of these oak doors so that I could fit them flush into the cabinet face frame for a more period look. I chose the paint colors to try and tie the carpet color to the buses interior. When you are working with recycled materials paint is one of the few color choices you get to make. 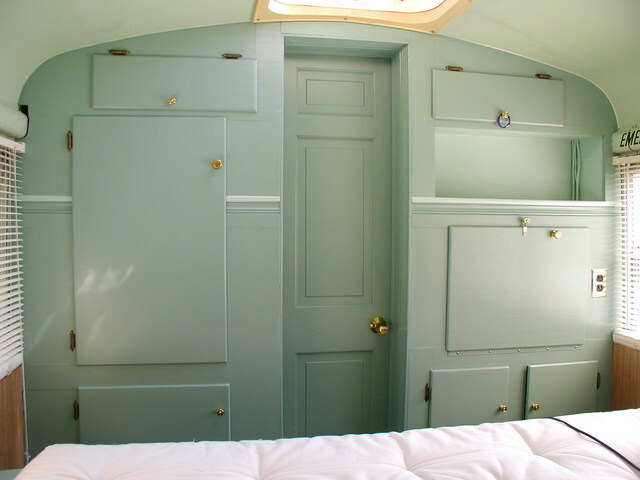 The darker green is from Glidden and is named "Mystic Seaport" and the lighter green is the closet match I could find for the school bus interior paint color and is called "Light Tourmaline." The carpet came from a friends dinning room. All and all I think the blues go quite well with the golden and woody tones of the woodwork and upholstery . There was not a lot of room for much more then a futon in the master's cabin. 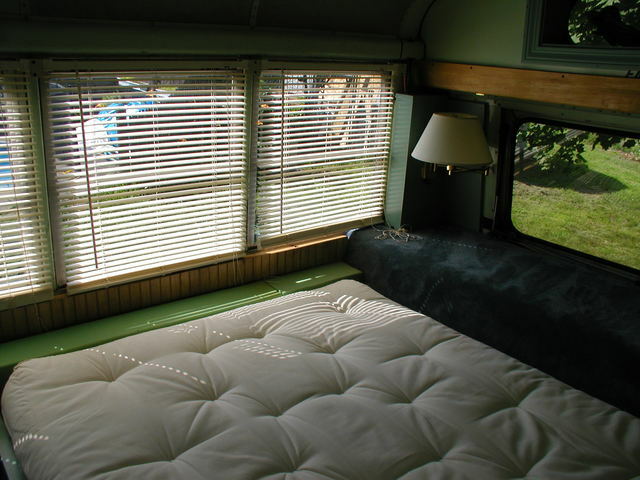 The futon's base is from an old waterbed and contains six drawers, the engine hump at the back is covered in more carpet and makes a nice nightstand. Most of the storage for the master bedroom is in the partition between it and the bunk room, its about a foot thick and contains a closet as well as a fold down desk on the right. Heres another shot of the salon, the table is a solid core door from Home Depot with legs made from a pair of old hat stands. The kitchen sink came from the aforementioned metal recycling bins at the dump and I bought the RV stove and dorm room style 'fridge. 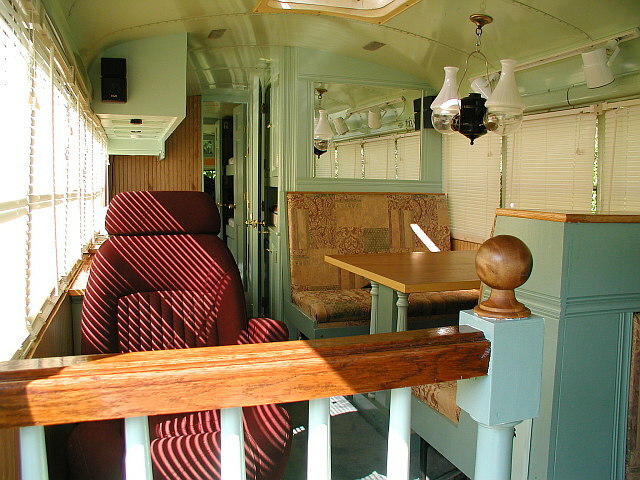 This is the original photo of the bus from the eBay ad – with all of the lights, PA, and STOP signs still attached. If you'd like to see some pictures of the actual construction of the bus, have a look at Part Two: Construction. speaking of safety – today in my local paper, a story of an RV getting off a exit ramp on I-95 in florida, lost control and hit a ditch then a pole or something, THEN caught fire, exploded and the driver burned beyond recognition. this makes me re-think my desire for a traditional motorhome. This is SO awesome!! My parents owned a yellow school bus when we grew up. 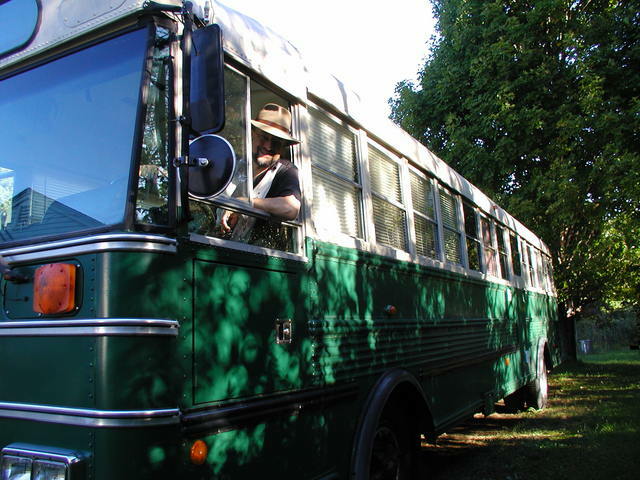 We lived in the country and the bus contained no seats and only a huge water tank. They used it to haul the water to the house from the well a mile away. 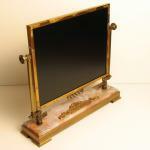 I’m sure that is where my love for this type of thing came from though, I loved it! My parents have now retired and moving into town and so they sold the bus, to a young man that wanted to do to convert it. My dad GAVE it to him!!!! Lucky guy! !